CCR9 expression on murine lymphocytes from normal mice. (a) CD8+ and CD4+ lymphocytes from MLNs were stained with anti-CCR9 antibody (open) or anti-CCR9 antibody that had been preincubated with the CCR9-immunizing peptide (shaded). Numbers represent percentage of CCR9+ cells with background staining removed. Background staining was consistently less than 2%. (b) CCR9+ CD8αβ+ lymphocytes coexpress αEβ7 integrin. (c) CD8αβ+ αEβ7+, but not CD8αβ+ αEβ7–, lymphocytes migrate to CCL25. The ability of CD8αβ+ αEβ7+ and CD8αβ+ αEβ7– lymphocytes to migrate to CCL25 (250 nM) or CXCL12 (100 nM) was determined in chemotaxis assays (see Methods). Results are mean ± SEM of quadruplicate wells from one experiment of two performed. *P < 0.0001. 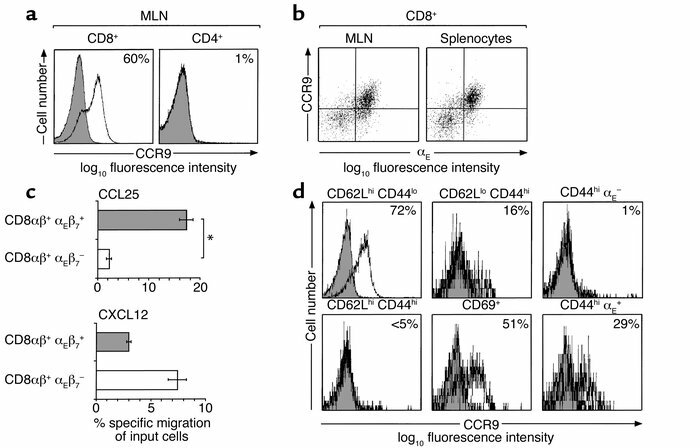 (d) CCR9 expression on CD8αβ+ lymphocyte subsets in MLNs. Numbers represent percentage of CCR9+ cells with background staining removed.